A few weeks ago I took a Saturday afternoon paddling trip down the Tuckaseegee River* in a canoe It was a gorgeous day, warm in the sun and chilly in the shade. My friend and his daughter are both experienced whitewater paddlers. I have mostly flat water kayaking experience on lakes, bayous and creeks so was pretty much just along for the ride. After my initial horror that I would be spending the afternoon on my knees in the front of the canoe, my leg muscles and I relaxed and enjoyed the trip, picking up some paddling pointers and lingo along the way. We spent the night at a group camping area in the Nantahala National Forest and had a fun time sitting around the campfire sipping red wine and listening to the kids tell jokes. On Sunday morning, the weather was cool and drizzly so I headed for home early. By mid-morning, I was starving so pulled off at the Bryson City exit, just outside the Smoky Mountain National Park, in the hopes of finding something good to eat. I parked and spotted the Cork & Bean, but the restaurant didn’t start serving for another twenty minutes or so. Wandering down the street and over the bridge, I found a place that looked promising, but had a long line of people waiting to eat. I’d rather spend my time window shopping than waiting so headed back up to the Cork & Bean, and am really happy that I did! 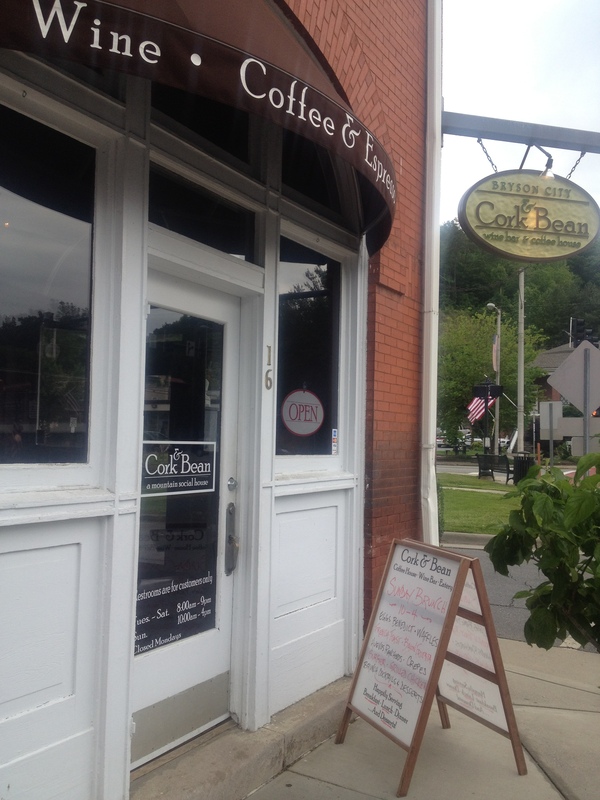 The Cork and Bean is located at the corner of Main and Everett street in the former Bryson City Bank building. It’s ambience is perfect for Sunday morning brunch — casual, a little bit of elegance combined with a little bit of funk: Cabin-style wood paneling, moose folk art, fabulous old dark wood arched top windows and very cool wrought iron chandeliers. The front room of the restaurant, where the bar is located is furnished with small tables as well as a cozy sitting area. 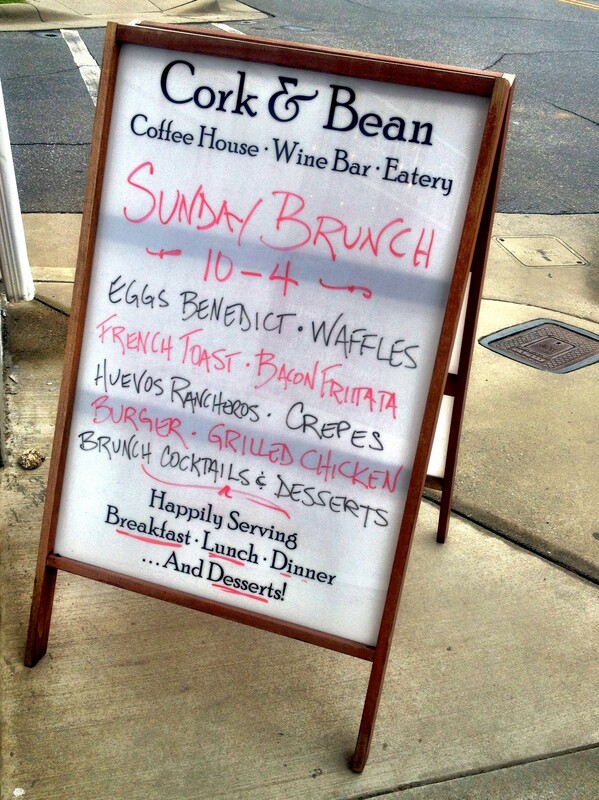 In addition to a good selection of wines and seasonal beers, the bar serves organic, free trade coffee and espresso, mimosas and bloody marys. I had stopped in the pottery shop across the street to kill some time while waiting for it to open. The artist working there recommended the Eggs Benedict. I didn’t need to be told twice! Mine arrived with a side of stone ground grits. 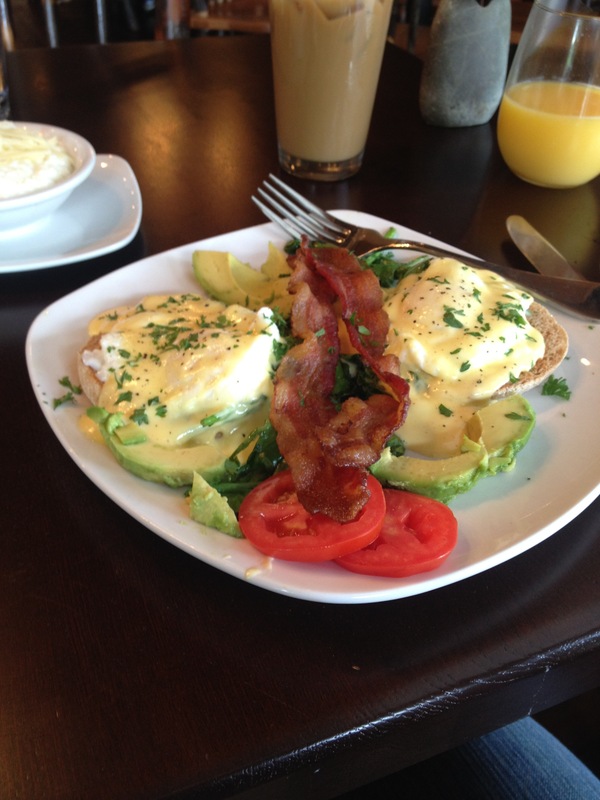 Cork and Bean’s Eggs Benedict is slightly untraditional — a toasted english muffin topped with well poached eggs and rich hollandaise sauce served over a bed of fresh spinach with slices of bacon, ripe avocado and tomatoes on the side. So much goodness! It was a beautiful plate of food. And I loved that the dish included more than token good-for-you fruits and vegetables to alleviate my guilt (just a little) about the poached eggs and hollandaise sauce. I relished every bite. I am not sure if I had been to Bryson City before that day. I had in my mind that the town was one of the little tacky tourist traps that dot the Smoky Mountains. And while there may be some of that in the summertime, the town itself is quite charming. With its many inns, lodges and B&Bs, it would be a lovely spot for a little romantic weekend getaway in the spring and fall. 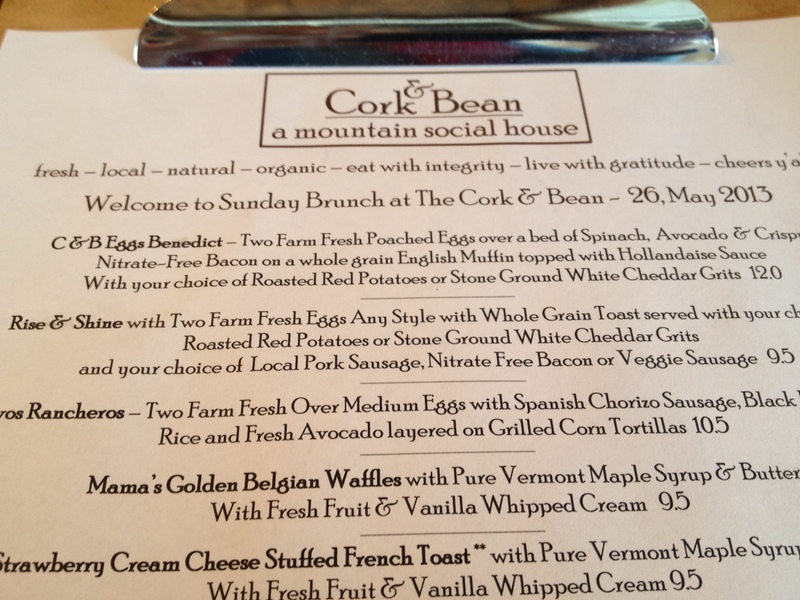 And if it were my romantic getaway, I’d definitely plan on making more than one stop at the Cork and Bean. *That is not me in the kayak, but the video gives you an idea about the scenery and water hazards! I didn’t take any pictures. I don’t have a copy of the menu, although it changes daily so would only be illustrative anyway. I can’t remember the name of our charming and knowledgeable server. I do know that I’ve been to Knife & Fork twice in the past couple of months, once for dinner and once for brunch, and that most every morsel that I’ve put into my mouth has been divine. The Spruce Pine, NC restaurant is owned by Nate Allen, the chef, and his wife Wendy. I first heard of it a couple of years ago at the Asheville Food & Wine Festival where the finals of the WNC Chef Challenge, which Nate won, were being held. A month or so later, I read about the chef and his restaurant in Cooking Light magazine when he was given their Small-town Chef Award for 2011. I’d been wanting to visit the restaurant and try his very inventive, farm-to-table food since. Chef Nate clearly shares my fascination with charcuterie. At Sunday’s brunch, I couldn’t help but order his confit chicken neck with asparagus, poached egg and grainy mustard. Everything about the dish was done well — the confit was meltingly tender and finished so that there were plenty of crispy bits. The split stalks of asparagus were cooked perfectly, bright green and tender, sauced with the yolk of the poached egg. 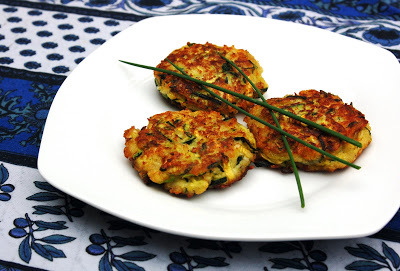 With a slice of grilled bread and some grainy mustard, I was one happy diner. On both visits, I’ve ordered the excellent house made charcuterie which comes with three varieties, a little salad and some grilled bread with spicy honey mustard. I can’t decide which was my favorite — the grilled rabbit liver or the pork terrine. Both the pork rillettes and the rabbit rillettes were also heavenly. The restaurant’s wine list has a carefully chosen selection of reasonably-priced bottles as well as a nice selection of wines by the glass. You can’t order alcohol before noon on Sunday in Spruce Pine, but the charcuterie platter arrived just in time for a glass of a nice red blend of Paso Robles varietals, Troublemaker Blend 6. I am looking forward to visiting this place often. Hopefully my next trip — during which I’ll order a number of new dishes, take lots of pictures and try another glass of wine or two so that I can write my official review — will be soon!